Dear Modern Farmer: Is It Legal to Slaughter a Pig in My Backyard? As you might remember, I briefly touched upon backyard slaughter of poultry back in October 2013. While the federal law discussed in that piece does not apply to the slaughter of swine (and therefore you should read on), I suggest you look at it anyway for the other insight it offers about backyard or on-farm slaughter in general. And let me be clear right up front: I am an attorney, not a farmer. I am not qualified to advise on any method of slaughter and do not attempt to do so here. There are plenty of experienced people out there who can help you with that, and I highly recommend that you seek out that information well in advance. No matter what the applicable laws and exemptions may (or may not) be, and no matter how lacking enforcement of the laws might be in some regions, I personally and fully advocate for humane methods of slaughter on all occasions, for all animals. That said, let’s explore some questions you might have, starting with how federal and state inspection and humane slaughter laws ultimately, but not solely, shape what kind of on-farm slaughter you are allowed to do. Can I slaughter pigs where I live? As I’ve mentioned in past Q&A’s, you will need to check local zoning regulations as well as any applicable private land use restrictions, such as subdivision/homeowner’s association bylaws to make sure the slaughter of animals is not prohibited. Failure to properly and humanely kill an animal can sometimes lead to felony cruelty charges and arrest. What about humane slaughter laws? One key difference between the slaughter of chickens and pigs is that while poultry is not subject to the federal Humane Methods of Slaughter Act of 1978 (HMSA) swine and other livestock are. The statute sets forth what it deems to be humane methods of slaughter, as do the regulations promulgated thereunder. However, technically the HMSA applies only to livestock slaughtered in USDA inspected slaughter plants, not on private property. Moreover, it does not apply to ritual/religious slaughter of animals (though given that this is pork we’re talking about, it’s hard to see how Jewish or Muslim slaughter customs would even come into play in this instance). Additionally, many states have passed similar or more stringent state humane slaughter laws. You will need to confirm whether any such laws apply in your case (the additional reading links below offer a starting point, but always confirm with your local attorney). Failure to properly and humanely kill an animal can sometimes lead to felony cruelty charges and arrest. What about inspection? The Federal Meat Inspection Act (FMIA) (21 U.S.C. §§ 601 et seq.) applies to the slaughter of pigs and other livestock (but not poultry). The primary objective of this federal law is to not only ensure humane transport and slaughter of animals, but also prevent adulterated/misbranded products from entering into commerce. Additionally, states have the regulatory authority to inspect/enforce under the FMIA. States also usually also have their own set of similar state statutes that you will need to review for compliance. But generally speaking, if you are going to use the meat from your pig solely for personal or household use, feed your guests and/or give to your employees – that is, the meat will not be for sale or sold in commerce – then you will be exempt from the provisions of the FMIA. This is true even if you decide to bring your pig to a properly licensed custom slaughter facility that can slaughter and butcher it for you in case you change your mind about doing it yourself. But be careful. In some states, like North Carolina (see this too) and Texas, the exemption for farmers to slaughter their own pigs seems quite clear. Then you read stories like this one from Vermont, and you realize it is not always easy to understand (or comply with) the laws. What is not exempt under these kinds of laws is, for example, selling parts of your pig for retail purchase, or killing and processing someone else’s pig on your property (even if it is for their personal use), unless you are properly licensed to do so in these instances. The bottom line is that you cannot operate a slaughterhouse without proper approvals, licenses and zoning in place. You will inevitably get shut down, just like this California man did. Increasingly, there are also new rules and licensing requirements on the books relative to mobile processing units, so you should also check those out if you plan on using one. What about using a gun? It goes without saying that using a firearm, in any instance, requires extreme caution and care to avoid any unintended consequences to the pig, yourself and anyone else nearby. Moreover, if you are going to use a firearm to kill your pig, you need to check all relevant ordinances and regulations that pertain to discharging a firearm. These laws, depending on where you live, may exist at the state, county and/or local level. For example, in Nevada County, although it is unlawful to discharge a firearm within 50 yards of any “dwelling house, residence or other building or barn or any outbuilding used in connection therewith”, there is an exception specifically carved out “for the express purpose of the lawful slaughtering of animals.” Alternatively, in some communities, you must be several hundred feet away from residential dwellings. Others expressly prohibit discharging a firearm within city limits save for some very narrow exceptions that do not include slaughter. Many of the ordinances that do allow the discharge of a firearm might also have provisions about what time(s) of day a firearm may be discharged along with other rules. Violation of these ordinances can include monetary and other penalties, so you must check first if you are going to use a firearm in your slaughter practices. What about nuisance laws? Nuisances are dealt with at the local (and sometimes state) level. Most cities and towns have at least some anti-nuisance laws on the books that prohibit bothersome noise, odors, pests and the like. Even if the nuisance ordinance is vague in its wording, you can still be subject to a nuisance claim under common law, so it is prudent to act responsibly at all times. In fact, when it comes to resistance to on-farm or backyard slaughter, this is usually where the neighbors come into play, particularly if they live within earshot. Indeed, perhaps the most troubling part about pig slaughter for most individuals is the sounds and smells that can come with a slaughter not done properly, and enforcement of nuisance laws are a novel way for neighbors to stop such conduct. Take a look at what has been happening in Florida. What about sanitation regulations? 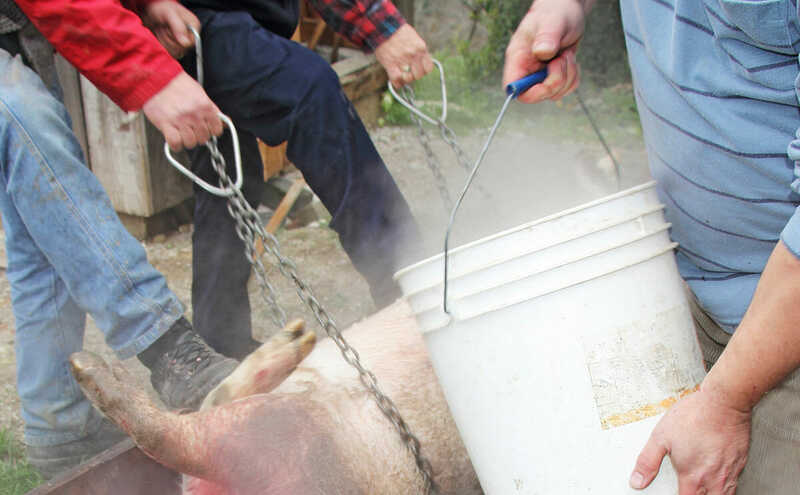 Slaughtering your own animal will require you to deal with properly disposing of blood, wastewater generated during the slaughter, and inedible parts of the pig. Many farms can take care of this on-farm through composting, burial or burning. But depending on where you live and the size of your property, this may not be a viable option (consider the smell and potential pests it will attract), and so you will need to give some consideration to this part of the slaughter process. If this is your first pig slaughter, just read this to get a sense of the amount of pig parts you will need to consider (and these are just the ones to be eaten!). Again, the rules vary from town to town and so you should check with your local board of health, county cooperative extension office and/or state department of agriculture to point you in the right direction. Law Review article (2007) out of Duke University Law School: Though it is a few years old now, provides a good synopsis of the usual methods of slaughter and the history of federal and state humane slaughter laws. State humane slaughter laws compiled by Michigan State University College of Law (Animal Legal and Historical Center): This list is from 2006 so it is likely to be outdated in some cases; check with local counsel for the most current laws. Other state food/farming laws compiled by Michigan State University College of Law (again, this list is likely dated so check with local counsel). A rural homesteader’s photo journal on the day she and her family slaughtered and butchered their pig. FAQ compiled by Northeast Organic Farming Association of Vermont ”“ some common Q&A’s regarding Vermont’s slaughter rules. Explanation of federal and NY laws compiled by Cornell University Small Farms Program ”“ scroll down to see the helpful flowchart.